June is just around the corner and we are already eagerly preparing for our "Super Heroes and Super People" Reading Clubs on June 14th. We are still on the search for 172 more volunteers so please take a moment to sign up to give the kids a great start to their summer! Don't forget to also join our Facebook event to help spread the word to your friends and family. On Wednesday, June 11th mark your calendars to play Legendary Bingo at Hamburger Mary's in West Hollywood! If you've been before you know it's a blast. If you haven't, it's time to see what you've been missing! There is a $20 suggested donation at the door (cash only, please!) which includes 9 regular bingo games and one grand prize bingo game with fantastic prizes! Remember, the show is R rated and a ton of fun. Legendary Bingo is very popular and there is limited seating available. Plan to arrive before 7:00 p.m. to get a seat. We strongly suggest making a reservation (you must have a party of 6 or more) at Hamburger Mary's to ensure your seat. You can call Hamburger Mary's at (323) 654-3800. For more details, visit our Bingo event on Facebook and share it with your friends! Please also click the image below for a flyer in .PDF format, and forward it to anyone you know who may be interested in going to our Legendary Bingo Night. Please also print out the flyer and post it wherever many people are likely to see it, perhaps with a note that you are going and inviting others to join you. Be there or be square! It's time for Dodger baseball with your fellow Reading to Kids volunteers! Join us to meet other volunteers, enjoy a summer evening, and cheer a great game against the Colorado Rockies! Or, find Rachel at Los Angeles Elementary School during the June 14th Reading Clubs or at El Cholo afterwards. Send your questions to Rachel at Rachel.Harter readingtokids.org. To see who else is attending, you can RSVP through either our Facebook event or Rachel's Evite. Get your tickets from Rachel before she sells out, and we hope to see you there! Did you know you can support Reading to Kids just by shopping at the grocery store or using your credit card? Vons and Ralphs both have programs that are NO COST ways for you to donate to Reading to Kids. All you have to do is go online and register your grocery cards. When you use those cards at a participating store or service provider, the store will donate a percentage of your purchases to Reading to Kids! Click here for simple instructions on how to sign up! Do you shop on Amazon.com? 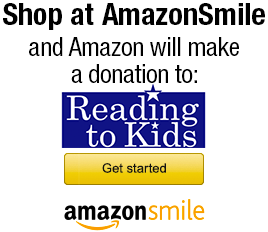 If you shop using Amazon Smile, they will donate 0.5% of your purchases to Reading to Kids! Click here for easy directions on how to start using Amazon Smile! Do you sell items on eBay? If you list an item on eBay through their GivingWorks program, you can donate some or all of the proceeds to Reading to Kids! Thanks, and we hope to see you at the reading clubs!